The association between CETEC Pty. Ltd. / NABERS and Paharpur Business Centre is an outcome of a Victorian Government led Trade Mission to India. Paharpur Business Centre is India's first retrofit building to earn top rating for its green space and its indoor air quality conforms to American Society of Heating, Refrigerating, and Air-Conditioning Engineers (ASHRAE) World Health Organizations (WHO) standards. Announcing the first international certification for NABERS, Dr. Vyt Garnys, Managing Director, CETEC Pty. Ltd. said, “PBC qualified NABERS parameters by using unique technologies in combination with best practice and extremely high aspirational targets set by the owners. PBC addressed achievement of high Indoor Environment Quality by attending to control all pollutants such as fine particles, CO2 and enhancement of oxygen levels by the use of plants and mechanical practices. Mr. Peter Varghese AO, Secretary of the Department of Foreign Affairs & Trade, Australia Government said, “Being performance based, a NABERS Indoor Environment rating provides proof that the technologies which have been implemented at PBC have been commissioned well, are being managed well, and are providing tangible benefits to the building’s occupants in the form of a more comfortable and healthy workplace. Mr. Kamal Meattle, CEO Paharpur Business Centre and Software Technology Incubator Park, added, “Given that Delhi’s air is practically unfit for breathing, it is great that we have a third party verification of good air quality at PBC – for wellness and productivity of our occupants. People working in buildings need to keep well and it is a well-known fact that indoor air is 10 times more polluted than outside or ambient air. What does one do, when the ambient air is itself unacceptable? CETEC Pty. Ltd. focuses on reducing risk and providing solutions. CETEC’s scientific and technical approach to IEQ (Facility Ecology™) makes them a national leader in this field. CETEC has been a long term and firm advocate of improving occupant’s satisfaction and wellbeing, corporate productivity, and facility efficiency through the development and use of the National Australian Built Environment Rating Scheme (NABERS) for Office Indoor Environment. CETEC was engaged by Breathe Easy to conduct an Indoor Environment Quality (IEQ) Study of their office building - PBC and because of their holistic approach, they also elected PBC to apply for the NABERS certification. Located in one of the largest and busiest business districts of South Delhi – Nehru Place, New Delhi, Paharpur Business Centre (PBC) is a green micro, small and medium enterprise (mSME) in the services and real estate sector that offers instant, managed & serviced Office Solutions on a “plug & play” basis in mountain fresh air ambience. Built to compulsory Government Design, it is the first retrofit building in India that is USGBC LEED Platinum EB Certified (under O & M category) in 2010 and a BEE 5star rated building with an annual energy hourly energy rating (AAhEPI) of 28 Wh/ hr/ sqm. Currently PBC operates at 20 Wh/hr/sqm and the endeavour is to bring it down to 15 Wh/hr/sqm. PBC and its suite of 27 support services are certified to ISO 9001, 14001, 22000, 50001; OHSAS 18001; SA 8000, and Food Safety and Standards Authority of India (under Act 2006). Paharpur Business Centre is also a signatory to the United Nations Global Compact (UNGC) and Women’s Empowerment Principles (WEP). PBC is the only mSME among the 6 signatories to WEP from India. PBC was awarded by ET Now for Best Workplace, in February 2013. PBC has also received special commendation from CoreNet Global in April 2013, for Industry Excellence, Economic Development and Sustainable Leadership. PBC has also been recognized for energy management practices and was presented the 15th CII National Award for Excellence in Energy Management in October 2014. PBC has been a leading provider of office facilities and services to corporate houses as well as Fortune 500 companies planning a foray into the Indian marketplace, for nearly two decades now. 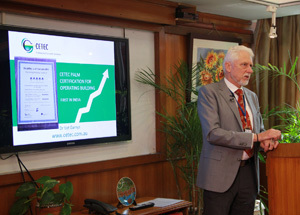 The Victorian Government Business Office in Bangalore provides an extensive range of support services for Indian companies looking to do business in Victoria. The office, established in 2005, promotes trade and investment in a number of key sectors including information and communication technology, tourism and associated direct air access, as well as the promotion of international education services, financial services and life sciences. Other priorities include promoting Victoria’s capabilities in infrastructure and construction, aviation and commercial aerospace, food, sports and events.